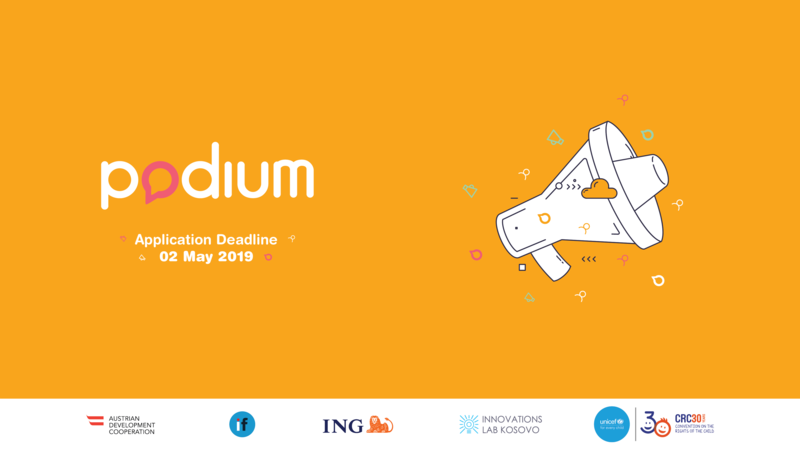 Podium, an initiative of UNICEF Innovations Lab Kosovo organized in partnership with IPKO Foundation, is a social advocacy workshop that teaches youth and adolescents of different groups in Kosovo how to advocate for the needs and rights of their community. In the workshop, they build their skills on assessing the needs of their community, by creating campaigns where they can lobby with the duty-bearers, and use the media to make their community issues known to the public. Get support and build your skills on advocacy for solving the issues of your community? Build positive relationships with the duty-bearers of your community? Learn how to implement your campaign? Be a part of the network of young advocates in Kosovo? Manage a budget of 500 EUR, as financial support to implement your campaign? *Eligible to apply are residents of; Ferizaj, Gjilan, Hani i Elezit, Kaçanik, Kamenica or Viti. All expenses during the three-day workshop (10 May – 13 May) will be covered by IPKO Foundation. If you need assistance throughout the application process, please contact us at podium@ipkofoundation.org or +383 (0) 49 196 655 or +383 (0) 44 816 574. The application deadline is Thursday, 2nd of May, 2019.